Yealink VC500 Videokonferenzsystem im Konferenzraum mit Funk Tischmikrofone und H.265 High Efficiency Video Coding (HEVC). Deployment is simpler than ever. VC500 can be installed on top of the display, fits seamlessly on TV with thickness from 1mm to 77mm, making your meeting room clutter-free. 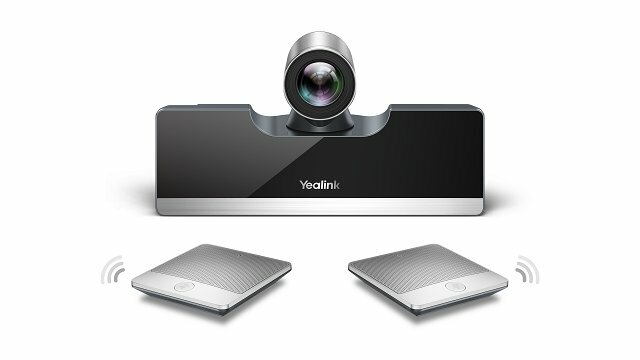 Yealink VC500 is a sleek, compact device including an integrated HD camera and a codec, only one standard network cable could connect TV area and conference table, saving more time and space for better communication. VC500-Wireless Micpod utilizes Yealink’s DECT technology, featuring two wireless microphones to optimize mobility within the meeting room by providing a stable voice transmission. Thanks to Yealink’s DECT technology, your table can be kept tidy and clutter-free. VC500-Phone-Wired includes a 5-inch touchable VCS phone backed by Harman speaker and Yealink Noise Proof technology to create an ultimate audio experience. VC500 brings efficiency to small and medium rooms by providing a powerful network adaptability. Minimal IT support is needed so that your team can focus on work. An advanced H.265/HEVC codec allows smaller groups to have 1080P video quality from 512kbps, saving 50% of bandwidth. With an excellent video packet loss recovery technology, VC500 resists up to 30% video packet loss to ensure a stable and care-free video communication.